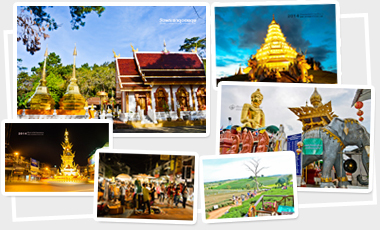 Chiang Rai is the northernmost province of Thailand, located on the borders with Loas and Myanmar, 68% of the land is mountainous 32% valleys. This city is the cross-roads of the famous Golden Triangle and its opium legend along with the remarkable scenery. With the towering mountains, craggy limestone peaks, great forests and waterfalls, Chiang Rai offers trekking adventures to open the gate to the northern way of life along with exotic hilltribe people. The mountains of Chiang Rai are the settlements of hilltribes, Thais and Chinese with beautiful plantation of rice, corn and tea on the slopes of these hills.